The new season of The Simpsons continues, and this Sunday, May 15th, 2016, Fox aired “Simprovised”, the 21st episode of Season 27, and the 595th episode to date. This Episode Fact File will recap the episode with pictures, video clips and more. Get the scoop right after the jump! After butchering a speech in front of all of his friends at work, Homer turns to improv comedy to gain back his confidence in his public speaking skills. Meanwhile, Marge decides to rebuild Bart‘s lackluster treehouse, but tensions rise when Bart questions her building skills. Also, in the episode’s last three minutes, Homer appears LIVE for the first time on television (both for East and West Coast broadcasts) to answer fan questions. Episode Details: ‘Simprovised’ is the 21st episode of Season 27 as well as the 595th episode of The Simpsons. The episode aired on FOX on May 15th, 2016 and was written by John Frink and directed by Matthew Nastuk. Homer is preparing his annual speech to do in front of all Nuclear Plant workers, his plan being to repeat the speech he did every year, however his lines were repetitive or offensive to the sick Lenny‘s grandmother. Mr. Burns used his only speechline he prepared and that made him nervous, and he passed out from the pressure, getting a trauma of public speaking. To calm down Homer, Marge took him to a stand-up comedy show, where Homer is amazed by the talents of the actors to improv, and decides to join an improv class, where he learns he has a talent for improvising scenes. Homer, Lenny and Carl tries their actor’s talents at Moe’s Tavern, where Homer gets acclaimed by the public and the Springfield Shopper critics. Homer gets an invitation to the perform at the Springfield Fringe Festival, but he was still insecure. He seeks advice from Moe, and Moe suggests he cheats by letting him pick the scenarios. However, Lisa finds out and convinces Homer not to. On a secondary plot, Bart and Marge go to Ralph‘s birthday party, and Bart realizes that Ralph‘s treehouse, built by his father with the money he got from the evidence locker, is better then his decading treehouse. When they return home, Bart starts destroying the treehouse and when Marge finds out what’s happening, she starts building a treehouse, however Marge overhears Bart being unthankful while talking to Milhouse, saying there’s no need to thank her, and that she was only doing her job. Marge gets really angry at him, but thanks to the help from Homer‘s speech cards, they reconcile the next morning. 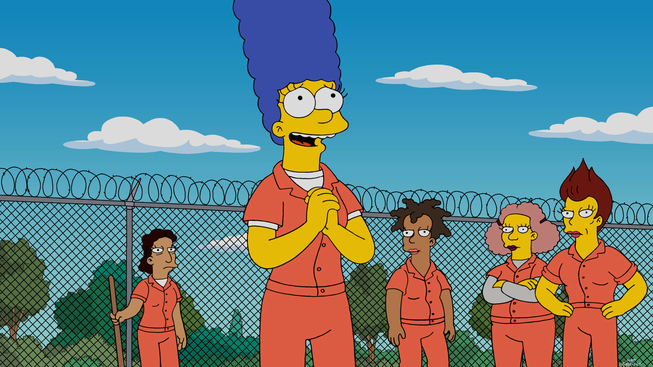 At the end, Homer is introduced by Lisa, Bart, Marge and Maggie, for the live segment, inside the Fox Studios Secret Bunker. 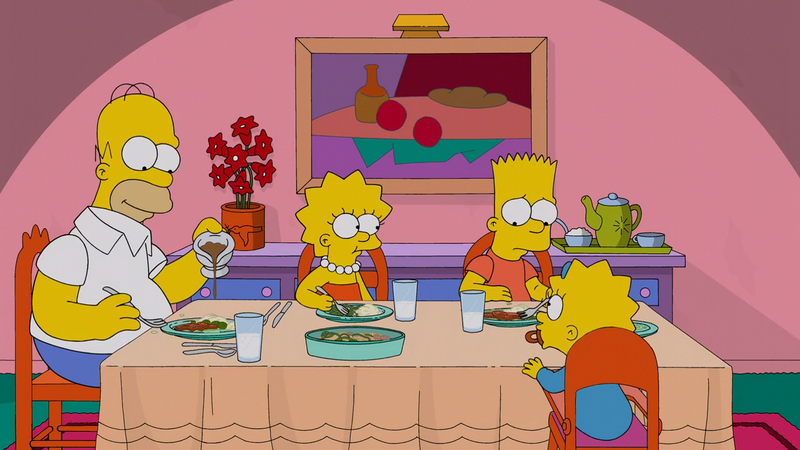 Homer answers calls from the TV audience, while several characters appear on screen, either performing some actions, showing cards, or in Bart‘s case, pantsing Homer. The secret bunker is later revealed to just be a fake set made out of cardboard inside the Simpson House. In an interview with The Wall Street Journal, showrunner Al Jean says “In terms of the anxiousness, I think this one’s very high. Admittedly, we always have a million safety nets. Now, we have far fewer.” Al Jean and his team revealed that they’ll be using a software by Adobe called Adobe Character Animator that will capture the voice of Dan Castellaneta and create Homer‘s mouth movement syncing it. Using the software, the team of animators will be able to control Homer‘s movements. David Silverman, producer and animator, adds “It’s not a computer drawing; it’s animation we’ve put in there that will be activated by these buttons, these triggers.” Al Jean confirms that “It’s not something you’d want to watch for the whole show.” and will last only three minutes. Tests on how it’ll go on both east coast and west coast airing has been done by the crew of the show and Al Jean, and also talked about future possibilities to expand on this “It’s an incredibly fluid medium”. Music editor Chris Ledesma put together the on-hold music for people calling in to Homer Live. Some alternates for the “Proof we’re live” speech were written but never used. The Washington Post announced Donald Trump has pretended to be his own P.R. man. Trump spokesman Ronald Rump furiously denies this huge allegation. In sports, Canada crushed Slovakia five to nothing in Group B of the World Hockey Championships. Look it up! To prove we’re live, the Toronto Raptors just beat the Heat. So did I, by pouring beer down my pants. To prove we’re live, on Friday, Fox canceled all the shows. From now on, everything on the network will be live, so it can be instantly canceled. Today’s New York Times front page investigates Donald Trump‘s unwelcome contacts with over 50 woman. Those are just his ex-wives. The joke on Fox cancelling shows on Friday refers to the Friday night death slot, expecially Fox’s, well known for its shows cancelled after being moved to Friday slot. TITLE SCREEN: Has the text “Homer Live! Call 1-888-726-6660 now. For additional information go to www.thesimpsons.com/homerlive” superimposed. TIE-IN! : A tie-in for The Simpsons: Tapped Out has been released, but with only some dialogue and a system message. 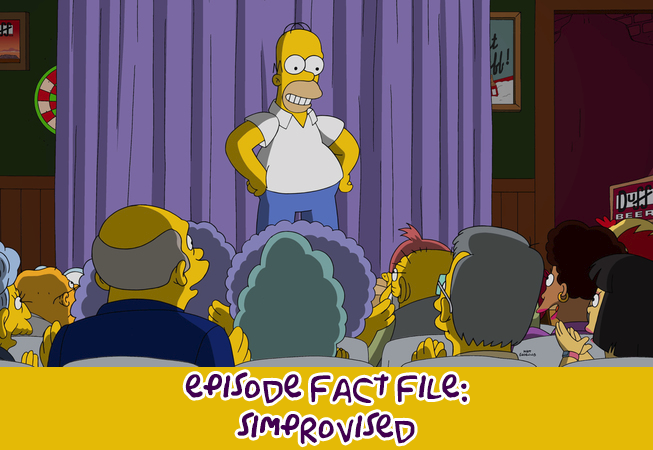 “22nd City” is a reference to famous improvisational group The Second City, which refers to Chicago but here shows how far down Springfield is on the improv list. When the leader of the improv class answers Homer’s questions with “Yes! Annnd?” he is demonstrating the two primary rules of improv: always agree with the premise; then extend it. The same night the episode aired, in the episode of Family Guy, Chris Griffin quoted Webster’s Dictionary in a speech too. Homer and Marge reference Frankenstein and the Bride of Frankenstein. Homer holds a copy of Truth in Comedy: The Manual for Improvisation by Charna Halpern, Del Close and Kim “Howard” Johnson. Lisa and Moe mention Barbra Streisand. Homer wants Meryl Streep to play him in a movie. Springfield Fringe Festival is a reference to the Edinburgh Festival Fringe. Comic Book Guy is dressed as Henry VIII. He is holding a turkey drumstick in his left hand, a reference to the urban legend that there exists a portrait of Henry VIII holding a turkey drumstick. His companion is dressed as Elizabeth I. The stand “Luigi’s Medical Marinara” is a reference to medical marijuana. The stand for “Blue Bronco Energy Drink” is a reference to Red Bull. The person seated next to label “Philosophy: Objectivism” is Ayn Rand. On the cover of “Treehouse Beautiful” magazine (a reference to “House Beautiful” magazine), Ralph is dressed as Tom Wolfe, in white suit. The music heard as Bart looks through the spyglass at the neighbors is the Flower Duet from the opera Lakme by Leo Delibes. A gleaming metal curvilinear treehouse designed by Frank Gehry. A treehouse in the style of a medieval French Gothic cathedral, with rose window and flying buttresses. The house from Up, which appears to be floating in air like in the movie, is shown to be suspended from a tree by a rope. The music heard over the historical treehouses is “The Great Gate of Kiev” from Pictures at an Exhibition by Modest Moussorgsky. When Homer finds the cookies Marge has discarded next to the tree and he says “The Keebler elves are real” he is referring to cookies made by the Keebler Company, whose advertising claimed they were made by elves living in a hollow tree. “Down-N-Out Burger” is a parody of In-N-Out Burger. The number to call during the live segment, 1-888-726-6660. The tweets were answered before and after the live segments directly on Homer‘s Twitter @HomerJSimpson. The questions on Facebook were answered before and after the live segments directly on the Facebook page. The Latin American airing of the segment, in some region, went with no audio, with only subtitles. The on-hold music for callers is the opening cutscene music from Treehouse of Horror XXIV, put together by Chris Ledesma. Homer mentions that this is the last episode of the show, only to say it was a lie and that that the show will never end right after. Homer says that the cast of Empire will answer the next questions Wednesday night and that somebody should be on the phone or will let them know. Homer says that after the show fades someone call Uber. Lisa holds a sign saying “We parked on Bill O’Reilly‘s spot”. Nelson holds Martin by his underwear in a yo-yo wedgie. Maggie spells “All Now” with cubes, and then corrects it to “Call Now”. Mr. Burns catches a blue butterfly with a net, but it flies away carrying him. Apu holds a basket with his Octuplets and a sign saying “Free to good home”. Bart enters behind the desk and steal Homer‘s pants. Bender holds a sign reading “Bring back Futurama (again)”. Bart knocks down the Fox Studios Secret Bunker walls, revealing it’s on the Simpson House‘s living room. Homer mentions Drake being terrible on Saturday Night Live from the day before the airing. Homer says that Joel’s call was a planted call with a planted question, this is confirmed by Al Jean on Twitter saying that it was Joel H. Cohen calling. Hannah: Hi there, Homer, my quest… my question for you is: Who do you like more? Lenny or Carl? And why? Homer: Let’s see. I like Lenny, because he’s the black guy, and… wait a minute, no. Carl‘s the… Wait. Let me get back to you when I figure out who’s who. Amanda: I was wondering if you give me any tips or tricks for making it look like i’m hard at work but really I’m relaxing and taking a nap? Homer: Always wear glasses with eyes glued to them. George: Hello Homer, so my question is pizza related. You prefer Chicago deep-dish or New York-style? Homer: Pizza? Let’s see, I prefer… Chicago deep-dish cause I like Italian better than Chinese. Joel: Homer, how are you doing? Homer: I’m doing all right. Is that your question? Joel: I was wondering what kind of car do you drive? Homer: A Sa- oh, uh, I drive a hybrid, which is a combination of old and terrible. Chris: My question is, what’s your favorite job? What was your favorite job? Homer: My favorite job would have been being an astronaut, because everything was done for me. And also I could give away from the boy. Homer mentions the Texas Rangers beating the Toronto Blue Jays by a technical knockout. Hours before the episode aired, Rangers second baseman, Rougned Odor punched Blue Jays right fielder Jose Bautista in the face during the 8th inning of the game. Homer says that Zachary’s was a planted call with a prepared question. The first caller’s name, Steven, was changed to William in the youtube video. Due probably to editing the video to change the name, the youtube video, and probably streaming and reruns version, doesn’t have the credits for the episode. Homer still says that they’re flashing on screen, as that’s how it aired on TV. Steven: How are you Homer? Homer: I’m good, is that your question? Steven: No, no, my second question is, if Donald Trump becomes the president, are you going to move out of Springfield and possibly move to Canada? Homer: Well, there are a lot of people that want me to move out of Springfield already. So– but I don’t think Canada will want me to, will welcome me. But you know what? That’s why I’m for Bernie Sanders. I love his chicken but out of respect we should refer to him as the Colonel. Michelle: Hey Homer, I was wondering, after all this years, how would you finally get rid of Patty and Selma? Homer: The best way is not to bathe. And I’ve been doing that for a month. But they smoke so much it seems to cover up the odor. But I’ve to say, I’m getting a lot of time to myself. Kathy: Hi Homer, I drunk too much this weekend. Homer: You drunk too much this weekend? Kathy: Yes, I drunk too much this weekend. What’s your best hangover cure? Homer: The best hangover cure is to sleep on the lawn and stay there, till Marge stops being angry. Zachary: What’s your favorite song? Homer: What’s my favorite thong? My favorite thong is that Brazilian one that– that doesn’t pinch too tight around the waist. The live segment was replaced with a pre-recorded sequence for non-live international and streaming viewers (except for sites that made available both airings like FOXNOW or Hulu), though only temporary till they get clearance from the callers required by legal. After Homer makes a joke about this being the last episode of the Simpsons, he then says, “If you’re seeing this, something has gone horribly, horribly wrong. Or, you’re watching the international version!” He then goes on to fill 2 minutes and 10 seconds by announcing his candidacy for president, making several outrageous campaign promises, then withdrawing his candidacy and making a joke about where Springfield is located. Treehouse of Horror series is referenced in Ralph‘s Treehouse (Treehouse of Horrors The Complete Collection is shown in a shelf). In the last three minutes of the episode, Homer was “Live-voiced” (by Dan Castellaneta) and answered questions fans already asked him on the phone. During the show, Homer answered live on Twitter and Facebook to fans posts too. In the season 8 episode “The Itchy & Scratchy & Poochie Show“, June Bellamy says “very few cartoons are broadcast live”. Ironically, 19 seasons later, part of “Simprovised” was broadcasted live. The UK airing of the episode, scheduled to air at the same time as US’ was pulled at the last minute. This is the 2nd consecutive episode in which the house from Up appears, having appeared in the previous episode a week before. At the Springfield Fringe Festival, Lisa‘s tie changes from gray to blue, and later back to gray. At the dining room, when Homer ask Maggie to pass the gravy, and pour on his food, his neck is animated behind his shirt collar and his left arm behind the sleeve. There are two Luanns in the crowd at the Springfield Fringe Festival. This pictures and videos are from the “Simprovised” episode of FOX show The Simpsons. Their use is believed to qualify as fair use under United States copyright law. Next Wild West: Last 24 hours for Act 2!